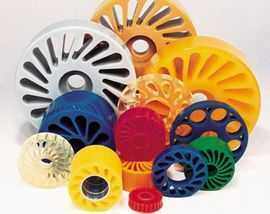 Urethane has excellent gripping properties, is cut-resistant and extremely resilient. These qualities, along with FDA-approval, made urethane the choice material for compliance rollers used in a premarket labeling process of apples. The compliance rollers adjust to different sizes of apples moving them through production unbruised and unmarred. Urethane compliance rollers reduce the time-consuming need to change parts in a number of industries moving materials of various sizes through production. Whether you are designing a new food processing piece of equipment or need to replace an old one, American Urethane, Inc. is the company you can trust to deliver a quality custom-molded urethane part, on time, and at a reasonable price.